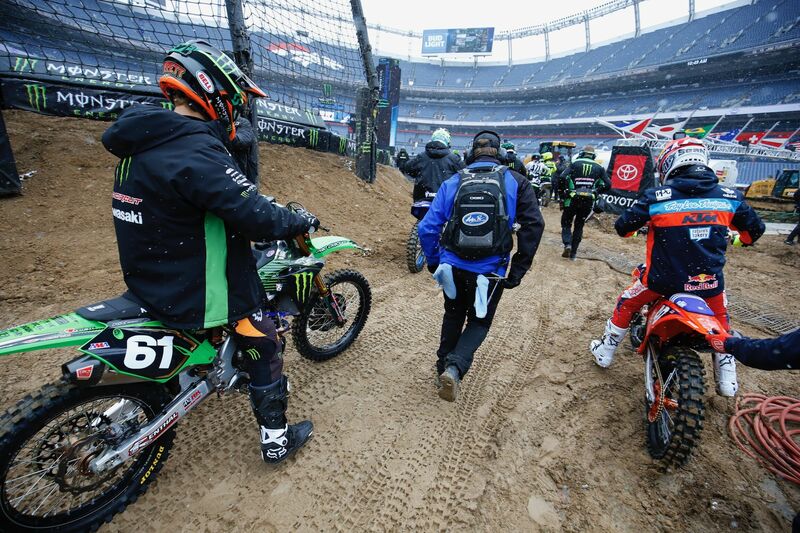 Foothill Ranch, Calif. (April 14, 2019) – Round 15 of Monster Energy® AMA Supercross, an FIM World Championship returned to the mile high city of Denver for the first time since 1996. Home-state hero, Monster Energy® Kawasaki rider Eli Tomac and Monster Energy/Pro Circuit/Kawasaki’s Adam Cianciarulo both captured victories at Broncos Stadium at Mile High in their respective classes, each earning their fifth win of the 2019 season. With frigid temperatures and snow flurries throughout the day, Tomac kicked the day off by pushing through the snow and qualifying with the fastest lap time while his teammate Joey Savatgy was close behind in third. 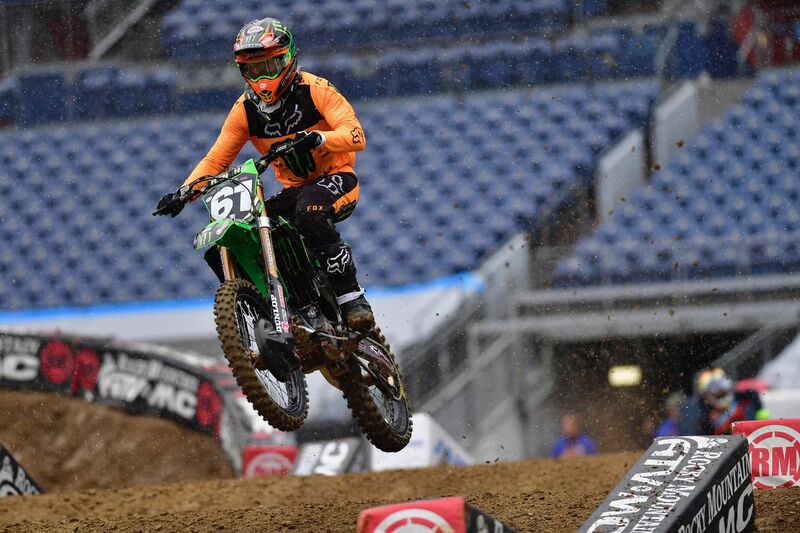 The Kawasaki teammates came out in front of the pack in 450SX Heat 2 with Savatgy in second and Tomac in fourth. Tomac challenged his title contender as they raced side-by-side for multiple laps until finally the No. 3 KX™450 of Tomac made a clean pass and continued making his move to the front. By Lap 7, Tomac was able to catch Savatgy and pass him for second, where he would go on to cross the finish line. Savatgy fell back to finish fourth. As the gate dropped on the 450SX Main Event, Savatgy launched out of the gate to another second position start, while Tomac was not far behind in fifth. Similar to the heat race, there were great battles going on up front where Savatgy held a top-3 position before being passed by his teammate and two others, but still earning another impressive top-5 finish. Meanwhile, the crowd came to life as the Colorado native was riding with confidence, resulting in a dominant performance; nearly three minutes into the race, Tomac had blasted by each rider in front of him and began checking out from the rest of the field. Tomac went on to lead the remaining 23 laps and crossed the finish line with nearly an eight-second margin of victory. Despite the roller coaster weather, over 50,000 Colorado fans filled the stadium and made sure to extend their warm welcome back to the city as they stood on their feet all night chanting “Tomac!” With the encouragement from the crowd, Tomac was able to gain some valuable points and now sits in second place, 18 points out of the top spot in the 450SX Rider Point Standings with two rounds remaining. 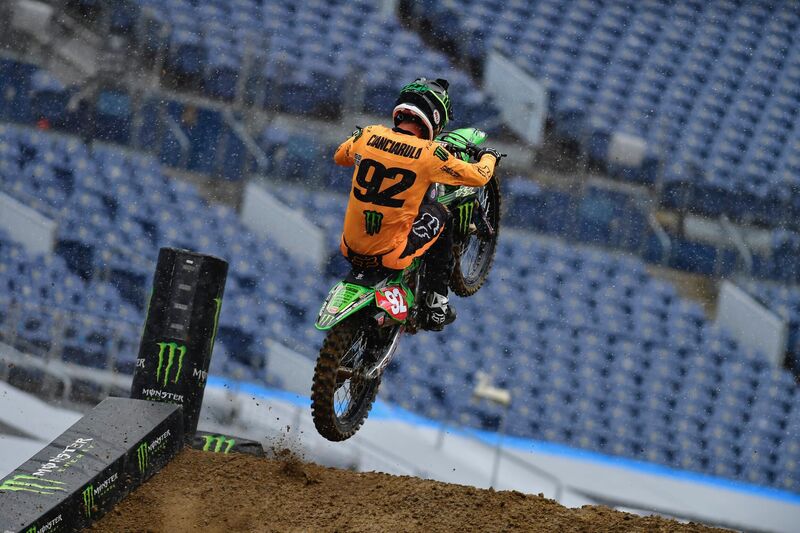 In the 250SX class, the Monster Energy/Pro Circuit/Kawasaki riders also rode great in qualifying with Cianciarulo clocking the fastest lap time and Garrett Marchbanks with eighth position. Cianciarulo carried that speed into Heat 2 as he started in third, quickly took over the lead by Lap 4 and then went on to take the checkers. The 250SX Main Event saw Cianciarulo running in second, stalking the leader and strategically maneuvering his KX™250 to find his way around. He played cat and mouse for a few laps before making the pass stick and going on to lead the remaining 15 laps. Cianciarulo secured his fifth win of the season and extending his lead in the 250SX Western Region Rider Point Standings with only the East/West Shootout in Las Vegas remaining in the series. Marchbanks struggled throughout the night and was forced to compete in the Last Chance Qualifier (LCQ) after not being able to finish his heat race. He went on to lead every lap and get the job done in the LCQ. Despite a poor gate pick for the Main Event, Marchbanks rocketed off the start and nearly grabbed the holeshot, but unfortunately collided with another rider mid-air before the first lap was complete causing an early end to his night. Cianciarulo and Tomac’s win in both 250SX and 450SX classes in Denver give Kawasaki their fifth event sweep of the season.